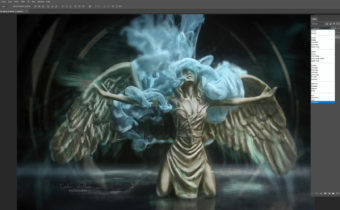 In this tutorial Caroline Julia Moore shows how to use channels to create a mask for extracting a model and placing her on a new background. Extraction using channels works best under certain conditions. The background ideally should be a uniform colour and the subject (or main edges of the subject) to extract should be in contrast; for example, a model with dark hair against a white background. Get the Premium Extraction Bundle for just $7! The bundle includes 4 pro tutorials on extractions! These images were created by Shift Art members, based on Extraction with Channel Mask. Join Shift Art to show your version! How neat! I like using the Channels, myself! I feel ‘validated’! LOL I figured out on my own that I could do the same thing, with the additional layers and darkening, then, moving the mask to the original. It seemed to work, so, this has been my main way of extracting for some time. Often, I will make the adjustments, create a comp and mask that, then, move the mask. I sure thank you for this! I should add, I made a brightness/contrast layer for the cabin, along with a Gaussian blur layer, and another brightness/contrast layer onto the model, to even out the image. Can you point me in the right place to find and use these images for practice? Thank you!